On August 21, 1974, the Cleveland Indians were in second place in the American League East Division, trailing Boston by six games. Although they were only three games over .500, it was the closest the Tribe had been to reaching the postseason this late in the season since 1959. But the Indians went on a five-game losing streak, and posted a 10-12 record though September 11. Although they were only five games out of first place, their position in the standings changed as they fell to fourth place. On September 12, 1974, the Indians purchased designated hitter Frank Robinson from the California Angels for the waiver price of $20,000. The Indians sent catcher Ken Suarez and, on October 10, 1974, outfielder Rusty Torres westward to complete the deal. 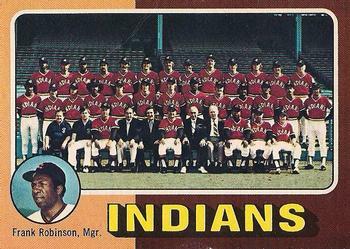 The company line was that Robinson was joining the Indians to help them make a final push at making the playoffs. But speculation arose that Robinson was being brought in to relieve Ken Aspromonte of his managing duties. Both the Indians and Robinson denied this allegation right off the bat. There may not have been a more accomplished player in the major leagues than Frank Robinson. He is the only player in baseball history to win the Most Valuable Player Award in each league (Cincinnati, 1961; Baltimore, 1966). He was also the Rookie of the Year (1956), World Series MVP (1966), All-Star Game MVP (1971), a Gold Glove winner (1958), and the Triple Crown (1966). By the time he joined Cleveland, he had 572 home runs and 1,773 RBIs. “I always wondered why we didn’t have more minority fans,” said club president Ted Bonda. “Cleveland broke the color line in the American League with Larry Doby. We had a number of black stars, yet the number of our black fans was well under 10 percent. When Phil Seghi claimed Frank Robinson on waivers, Phil was simply looking at Robinson as a player. I immediately thought of him being our next manager. There was nothing really wrong with Ken Aspromonte, though I thought he could be more aggressive. But we needed a drawing card, someone who would bring attention to the franchise. Aspromonte was not about to do that. Frank would. He had charisma. Robinson’s contract called for him to be paid $180,000 in 1975. The Indians wanted him to be a player-manager, for which they would pay him an additional $20,000. Robinson balked at the offer, arguing that managing was going to too hard a job for him to be paid only $20,000 more. But after conferring with his agent, Ed Keating, Robinson relented. The months passed by and the day of the season opener arrived. It was a cold, raw day in Cleveland on April 8, 1975. The temperature at game time was 36 degrees. With the wind whipping off Lake Erie, many of the 56,715 spectators at Cleveland Stadium may have believed it to be much colder. About 70 out-of-town journalists sought accreditation to cover the game. On the field, 25 photographers were at work. (Cleveland Stadium and Memorial Stadium in Baltimore were the only major-league ballparks where photographers could work on the field. The opposition was the New York Yankees. The Bronx Bombers were in a bit of a playoff drought themselves. The perennial favorite in the junior circuit of yesteryear had not made the postseason since 1964. They had won their last world championship in 1962. Surely they were wallowing in unfamiliar territory. But they were laying a foundation that would benefit them in future years with Graig Nettles, Roy White, Thurman Munson, Chris Chambliss, and Lou Piniella. The Yankees went quietly in the top of the first inning. As the Indians came to bat, anticipation stirred. 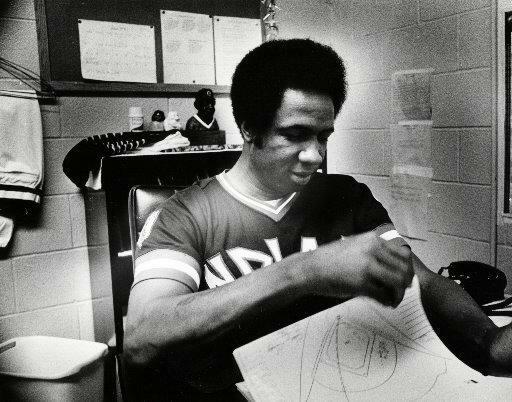 Frank Robinson the manager had inserted himself as the DH, batting second in the lineup after Oscar Gamble. The Indians left fielder fouled out to third base for the first out. Robinson stepped to the plate and drilled a 2-and-2 fastball from Medich over the left-field wall for a home run. The crowd went berserk. The euphoria was short-lived as the Yankees touched Perry for three runs in the top of the second. Chambliss drove two runs home with a double to center field, and then scored on a single by Munson. The Indians made it 3-2 in the home half of the frame when Jack Brohamer’s sacrifice fly scored Boog Powell. Powell tied it up in the fourth with a mighty clout to right field. Powell struck again in the sixth inning. The big left-handed batter, who claimed that “I look like the world’s biggest Bloody Mary”6 in the Tribe’s all-red uniforms, doubled home George Hendrick with the go-ahead run. Brohamer came through again, singling to center field to score Boog. Medich was knocked out of the game. Perry shut out the Yankees the rest of the way. In the top of the ninth inning, with a runner on first base, Chambliss hit a ball deep to right field. But Charlie Spikes retreated to the fence to haul it in. Perry went the distance for the win, striking out six. The hitting heroes were Brohamer and Powell, as they each drove in a pair of runs. But the day belonged to Frank Robinson. “Right now,” said Robinson, “I feel better than I have after anything I’ve done in this game. Take all the pennants, the personal awards, the World Series, the All-Star Games together and this moment is the greatest … the greatest. Cleveland finished in fourth place in 1975 with a 79-80 record. Future stars Duane Kuiper, Rick Manning, and Dennis Eckersley joined the team during the season and gave fans real hope for the future. As for Robinson, he was elected to the Baseball Hall of Fame in 1982 on the first ballot, garnering 89.2 percent of the votes by the baseball writers. He was selected as the AL’s Manager of the Year in 1989 when he piloted the Baltimore Orioles to a record of 87-75. In Cleveland, Robinson remains an icon. He was elected to the Cleveland Indians Hall of Fame in 2016. On May 27, 2017, a statue was dedicated in his honor at Progressive Field. He is one of only five Cleveland Indians to be so honored, joining Bob Feller, Larry Doby, Jim Thome, and Lou Boudreau. Click here to watch a video clip of Frank Robinson's debut as manager at MLB.com. 1 Frank Robinson with Dave Anderson, Frank: The First Year (Toronto: Holt, Rinehart and Winston of Canada, 1976), 64. 2 Terry Pluto, The Curse of Rocky Colavito (New York: Simon and Schuster, 1994), 138. 3 Russell Schneider, “Long Overdue, Says Calm Kuhn,” Cleveland Plain Dealer, October 4, 1974: 5-D.
4 Russell Schneider, “Pitching Top Need, Says Robbie,” Cleveland Plain Dealer, October 4, 1974: 5-D.
5 Robinson with Anderson, 60. 7 Bob Sudyk, “Robby Goes Pow – and Wow!” Cleveland Press, April 9, 1975: C-2.